From time to time I need to repair equipment and clothing while outdoors. Finding the right tools in nature is like searching for the illusive needle in a haystack. It’s much easier to spot a drinking straw. Size matters! This is a simple way to stock several kits with this essential equipment when you don’t have time to make needles out of scavenged critter bones. 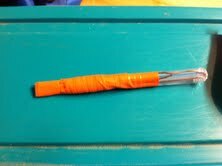 Here’s what you’ll need: Straw, needle, tread, safety pin, and electrical tape. If you don’t have drinking straws, stop by a fast food haunt and grab a few…for free. The brown thread pictured is a heavy gauge waxed thread I’ve used it to repair equipment in the past. It was in a sewing box I bought at an estate sale. Great find! Dental floss would also work very well. Steps 1: I made two straw kits. One for equipment, one for clothing. Thread the needle with about 6 feet of thread. I tie a knot in the end of the thread and pull it to the eye of the needle. This ensures that you don’t have to thread the needle in less than perfect conditions in the woods. It also lessens the chance of dropping the needle in the pine needles you’re standing on. Plus, you don’t have to employ fine motor skills to thread a needle and tie a knot with tiny cordage. Cloth needle and thread on left. Equipment needle and waxed thread on right. Step 2: Insert a safety pin about an inch into the end of the straw. Fold the end over and close it with electrical tape. I guess super glue or melting would work for closure. I like the tape. It gives more options in the field. 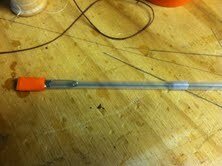 Step 3: Insert the threaded needle into the open end of the straw. Bend it over and tape it off. Step 4: Wind the tread around the straw in a coil. This is your bobbin. Once wrapped with thread, cover it with you tape. Step 5: Make another straw sewing kit for your clothing needle. Tip: use a different color straw or label them somehow. That’s it. These are lightweight and will double as drink stirrers when you stumble upon the moonshine still down by the creek. Hope you enjoyed. Written by: Survival Sherpa on October 21, 2013.